JW Marriott Marquis Miami infuses sophistication, design, art, fashion and technology into a diverse landscape of business, meeting and pleasure travel pursuits. Located in the heart of downtown Miami, close to the citys exciting Wynwood Art District, the new Frost Science Museum, the Perez Art Museum and the world-renowned Miami Design District, JW Marriott Marquis Miami has become the arts and culture hotel in the middle of it all. 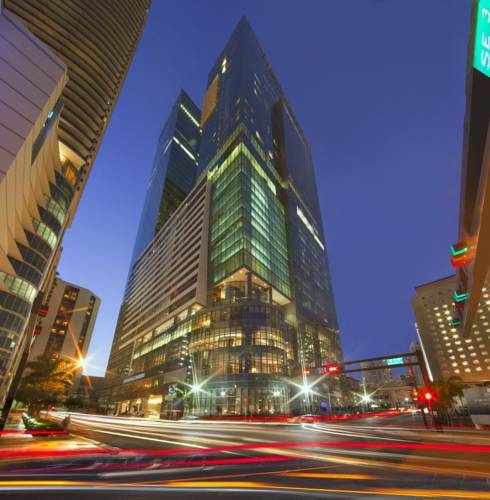 Right at the gateway of the Brickell Financial District and a short drive from South Beach the hotel is perfectly placed in Miamis epicenter. The hotels blend of sleek and modern design boasts 313 stunning guest rooms with state-of-the-art technology. Famed chef Daniel Boulud's Mediterranean style restaurant Boulud Sud is a delicious destination for breakfast, lunch or dinner. Relax and unwind by our stainless steel sky pool and indulge yourself at Enliven Spa. Boulud Sud Miami: A vibrant celebration of the sun and the sea. Chef Daniel Boulud s Mediterranean concept, Boulud Sud, is located on the lobby level. Intermezzo: Intermezzo is partnered with illy coffee and will carry the designation, Artisti del Gusto. A perfect combination of the mastery of technique and passion for authentic espresso preparation and presentation. Pastries and sweet goods are also available. Concierge Lounge - 36th floor: Available to guests staying on concierge levels and platinum and above Marriott Rewards members. Open for afternoon refreshments. Breakfast for concierge guests available in 345 on 2nd floor.